The first videos and photos that have emerged on social media show what appear to be the strikes by the US, the UK and French militaries in the Syrian capital. 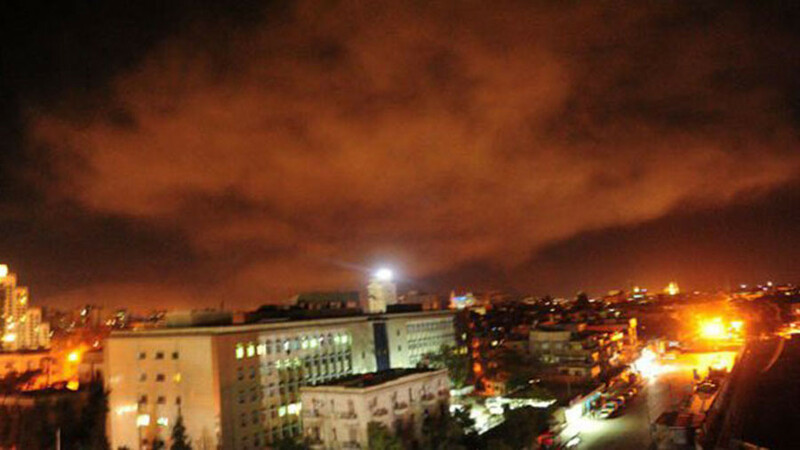 Syrian state TV reported that Syria’s missile defenses shot down 13 missiles south of Damascus. The Chairman of the United States Army Joint Chiefs of Staff General Joseph Dunford, however, said he was not aware that any missiles were intercepted, adding that the military has yet to assess the operational data. He confirmed that manned aircraft were involved in the airstrikes that hit three facilities in Syria that the US claims are part of its chemical weapons program. One of the targets was a scientific research center in the greater Damascus area, Dunford said. The second was “a chemical weapons storage facility” in the vicinity of Homs, which, according to Dunford, housed sarin and chemical weapons precursors. The third target was also located near Homs and was identified by the general as a Syrian Army command post and storage facility. The US military action in Syria was “a one time shot,” US Defence Secretary James Mattis said during a Pentagon press briefing, adding that he doesn’t rule out further action by the US if the Syrian government decides to mount chemical weapons attacks in the future. The US used about double the number of weapons that US forces deployed during last year’s strike on Shayrat airfield, Mattis said. In that strike, 59 Tomahawk missiles were fired at Al Shayrat airfield in Syria in response to an alleged chemical attack in Idlib province.